In response to an invitation from Council for the Municipality of Kincardine, a senior manager with Ontario’s Ministry of the Environment and Climate Change confirmed to Council that nothing is being done about the hundreds of recent noise complaints about a local wind power project. 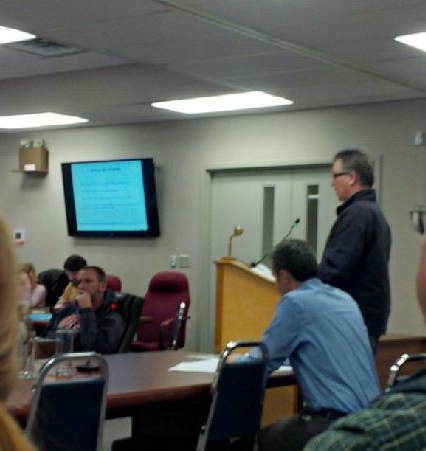 Rick Chappell, manager of the Owen Sound District Office, told Council that there is no completed audit of compliance with noise regulations for the Enbridge Underwood project. This is despite the fact the facility has been operating since 2007, and the audit was requested by the Ministry in response to early complaints about excess noise emissions. His presentation also acknowledged adverse health effects from the noise and vibration produced by wind turbines, including low frequency noise and infrasound. When questioned, he stated that there is no peer-reviewed evidence that infrasound causes direct health effects. He was unable to provide an answer when the Councillor followed up with a question asking if there were indirect health effects. Chappell provided details of the long history of incomplete audit submissions for the Enbridge project. The earlier submissions were deemed to still be incomplete under the new protocol and the company has submitted additional data to meet the requirements with the last submission taking place on November 15. He indicated that Enbridge has been given a commitment of expedited processing and they expect a decision on whether their submissions are complete by mid-December. Analysis of their data would follow that decision. The post-construction audit for the nearby Armow project was submitted three months ago and is under review in Toronto. At present, he said, that he could not provide an update on the assessment of this audit except to indicate that there has been no decision and he was not aware of the timeline for a decision. The fact is, Chappell admitted, the Ministry group reviewing the audit reports has large backlog of reports submitted by the project operators from across Ontario based on the new noise testing protocol. Chappell advised Council that the new protocol recommends that noise audit submissions are only made public once they are accepted by the MOECC. This is statement does not align with the protocol which actually requires posting of submissions to the Ministry be posted on the project website within 10 business days of the submission to the District Manager. Neither Enbridge nor the Armow submissions have been posted. Once a compliance audit is underway, the MOECC stops responding to complaints from residents living in the project until the results of the audit are known. In his view, the potential for non-compliance has already been identified and until this situation is resolved, there is no point in additional testing. This approach applies to the Enbridge project even though the audit process started in December 2011 and is still not complete. Once Councillor questioned the whole compliance audit process, indicating she believed that the process is designed to generate results that showed compliance. Her concern was the more than 500 complaints from residents of the Enbridge project that are now essentially being ignored by the MOECC. Even if the project was found to be in compliance, she was looking for action on these complaints based on the approval held by Enbridge. Chappell’s answer did not satisfy the residents in the audience. Chappell indicated that compliance audit process was posted for public comment prior to the release of the April 2017. This statement overlooks many citizen submissions regarding flaws in the old process, including a lengthy brief from WCO, which were ignored by the MOECC meaning that the flaws in the original process were not connected and the audit process excludes situations that generate any resident complaints about noise emissions from wind turbines. Another Councillor questioned what steps that the MOECC would take if, hypothetically the audit process found the project to be out of compliance. Chappell indicated that the MOECC would ask the company to submit a mitigation plan to address the issues. Changes could be reduced operating speeds, shut-downs of problem turbines in specific wind conditions or times of the day. When pressed about the time required for this type of plan to be developed, implemented and approved by the Ministry, Chappell suggested that it would be weeks rather than months. The situation is similar to many other wind power projects in Ontario where complaints have been filed by residents for years, with no resolution and in some cases, no action by the Ministry. Documents released under Freedom of Information to Wind Concerns Ontario show that there are now at least 500 formal reports of excessive noise and vibration from the Armow wind turbines. This information needs to make it into the mainstream media. Rick Chappell is worse than worthless! He cares nothing about people or the environment. It would be interesting to know his educational background other than he “attended Fanshawe College”and his employment history prior to being hired by the MOECC in 2008. It is not listed in his linkedIn account. Does anyone know? A similar meeting needs to be held for the residents complaining about the K2 Wind project in Ashfield Colborne Wawanosh. People started reporting the harm to the MOECC shortly after the turbines were turned on. They have been being harmed ever since March of 2015. Three of our members and our three top municipal officials met Chappell and Pietz his right hand field officer to ask why he has maintained through 4 years and 400 complaints that Unifor audit testing is voluntary dispite Approval Director Dumais’s written directive it was mandatory in the first two years. His answer was that it was not specifically written in the Certificate of Approval of a pre GEA project. ( unlike recent projects ) When pressed about his blatant disregard of the Director’s written requirement he said he feared Unifor would take him to an ERT hearing. Later when asked what it would take to make him believe residents do suffer headache, nausea, vertigo he answered he or one of his staff would have to experience it. Our 2,000 page FOI clearly shows Chappell being MOECC’s gatekeeper for projects in this large region. Use this as evidence to prove MOECC is failing to protect the citizens of Ontario….. Here are video recordings of the Oct 26th 2017 meeting at Huron County Health Unit. Dr Bokout (MD) and Dr Erica Clark (PhD) explain to the citizens of Huron County how they will continue to study the already documented health harm. Further they tell the citizens that the Huron County Health Unit lacks the authority to turn off wind turbines. As we have noted before, if you get the “moderation” message it is because you are posting the same message over and over, and/or including a large number of links, both of which the web server sees as spam. How is posting NEW video recordings “the same information”??? Should the public not see these videos and decide for themselves? Will the “sound study” that you have worked on be left out of the present situation? Or does anyone know? Hey folks (newbies to this ongoing tragedy)…the people of Shelburne and Clear Creek Ontario has been reporting to the MOE, while suffering and in some cases people have deceased, since prior to 2008; hence the evolution of the original “Ontario Wind Concerns” site (check the archives). There has been much reporting, public disclosure, and reporting to all levels of government to no avail. I refer to this as the “silent war” that has been ensuing between the people of rural Ontario, wind companies, and the government. It is been a “David and Goliath” battle. We are in the process of disclosing the biggest government scam in the history of Ontario – governed by the unethical, unconstitutional ways under the rule of the corrupt Liberal government, in the guise of “The Green Energy Act”, ripping off billions of dollars of taxpayers money. It goes back to the Dalton McGuinty days..remember the proroguing of the government and McGuinty stepping down..Kathleen Wynne is well aware of the frying pan she stepped into when she became Premiere of Ontario. We will have our day with these Liberal bandits; the outcome will not be so merry for them. Hang in there Ontario. Strength is in numbers. Justice will prevail. There is a light at the end of the tunnel. I saw Brad Duguid in the news last night; another member of the original merry bandits; nauseating scum bag. “Waiting for moderation”…interesting. I’ve had the same experience. In the past I have also found words were taken out of context; the meaning con-skewed to formulate an unintended meaning. I was banned long ago from the newly formed site Ontario Wind Resistance that branched off this original site at the time. Due to illness, humiliation and public disrespect, I had also discontinued to speak at public information meetings. Perhaps when it comes to the courts, class action suit, etc. ; my support will be moderated as well. The “moderation” message is automatic from the web server if a comment is posted that is repetitive, long, contains a large number of links, or contains foul or abusive language. As regards editing of comments, we recall that we did that ONCE in one comment, and emailed you beforehand. The day I was called to witness and testified at the Ostrander Point tribunal, I was asked to disclose 8 years of medical documentation and cross examined for three hours by the panel of government lawyers; to find that negative human health impact was completely disregarded, and the welfare of the oh so famed “Blanding’s turtle” prevailed. I was happy for the people of Ostrander. However, my view of Ontario and faith in humanity was shattered. This past year the Trudeau government dredged up the “Give Me A Place To Stand” tv commercial of the early ’70’s, with a contemporary spin featuring a young refugee girl…another huge slap in the face. My “place to stand and place to grow”, my home was literally taken from me by our government and the Liberal people of Ontario.. I cringe when the commercial aired – at what I once considered a beautiful song and a beautiful place to be. With my illness, I have become very limited as to where I can reside in Ontario because of the industrial wind turbines and the toxic infrasound and low frequencies polluting the environment. I have been told many times to unload my problem to another – perhaps placing another family in harms way. I have not done so. THIS IS NOT ETHICAL. This is selfish. I am now in position of losing my home to the TD bank-a highly invested shareholder in the big wind industry! They were hoping I would be like many of the other rural Ontarions who have gone away, and or died. I am now feeling the full force of this nightmare that has been imposed upon me. Recently this past summer I had asked the original CEO of ErIe Shores AIM Powergen development who developed in the land surrounding my home to purchase my home for a reasonable amount of money. In response to my request, Mike Crawley-now multi millionaire from his lucrative scam, also former president of the Federal Liberal Party suggested I approach the current company, that he was no longer associated with this development. He wished me well! This is oh so typical of the Liberal way; an underlying ugly truth cloaked in the rainbow facade of rainbows and sunshine exterior. “Remembrance Day”, which I hold close to my heart with much respect for those who fought in the great world wars, also presents a great sense of sorrow, sadness and disbelief. I am greatly appauled and very disappointed. I continue to succum to ongoing illness. If I had a gun, the last bullet would have my name on it..thanks Ontario. Be proud of your reputation of being known as nice complacent Canadians. Reality is…a dumbed down society who are being lead to the slaughter. The beautiful land of southern Ontario is being taken from us. The prime agricultural lakefront property of the largest body of fresh water system in the world, The Great Lakes System is now controlled by the wind companies/government. At the end of the twenty year leases currently between the land owners and the government, if the land owners do not engage in the very costly decommissioning process of the wind turbines, contract states the land goes to the wind company. What a sneaky acquisition of land. Unfortunately the landowners were left ignorant to this fact, buried in the legal uncomprehensible mumble jumble of the intensive contracts that they failed to have reviewed by lawyers as they were not permitted to prior to signing! We are in the eleventh hour; and beginning to witness acts of terrorism as evident in other parts of the world. We are a few years behind, it’s coming down the pike and I’m afraid of what may be inevitable. Please Ontario, we desperately need a change of government. I’m not sure this is possible. The government has brought in an influx of immigrants with newly acquired Canadian status granted to them by the Liberal government. Together with the Toronto riding and the teachers’ unions – it is more important then ever for each and everyone of us to take a step forward to make this change of government happen. It is our only salvation. The one thing each and every one of us can do is vote. It’s a small effort on our part towards a very positive outcome that will benefit all of us: making Ontario great again. Please help make it happen. Come election time please VOTE. Kick the Liberals to the curb. This is critical to our children, our food and water, our complete well being. A sense of entitlement is no longer sustaining Ontario. Nothing is forever. We must step up to the plate. We are seriously digressing as the province we once knew. Wow, can’t add much to that. Thank you from my heart Tracy. How do so many well educated people get played so easily? Selfish to the extreme I guess. Entitled to their entitlement sort of thing. You/we are good citizens of humanity and that is our downfall. To the victorious in any battle go the spoils but most Ontarians have simply caved-in without a fight so the Liberals just dictate their intentions. This is the new definition of democracy.